Samsung Gear VR v Google Daydream View: Which headset is best for you? Both affordable future fun – but to Daydream or go Gear? The Samsung Gear VR and Google Daydream View occupy that interesting space between crappy mobile VR viewer and high-end headset you might not be able to afford. 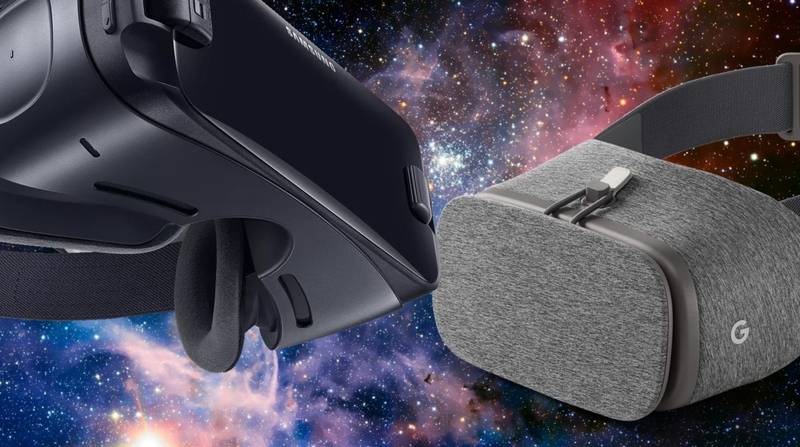 Sure, there are other pretenders to the mobile VR crown - such as the Xiaomi Mi VR and LG's 360 VR abomination - but, trust us, stick to Samsung and Google's headsets for this category. But which one is best for anyone after a plug and play mobile headset to get into virtual reality? Essentially, you can't go wrong. But to ensure you make the right choice for you, we've compared design, comfort, features, display, apps and games, controls and price below. First up, both of these headsets are the slot-your-phone in variety and can be used with various smartphones. Google and Samsung deal with this in different ways. With the Gear VR (there are a few models now, Samsung seems to launch a new one with every high-profile smartphone) you physically attach your phone to the headset via its microUSB or USB 3 port. There's a couple of blocks you can swap out on the latest models if you're passing it round to friends and family but if it's just for you, you can set it up within 30 seconds and you're good to go. The Daydream View connects to your phone via NFC and does a good job of recognising it quickly. The phone is held in place by the front of the case and if you have the 5.5-inch Pixel like us, it'll stick out. Design wise, the Daydream is the nicer looking and, well, feeling, as it comes in a lovely cloth finish and a light body that's smaller than the Gear VR. So it'll look a little less gadgety lying around the house than the plasticky Samsung. But when you're in VR you don't care about what you look like. As for comfort, I prefer the Gear VR. It feels secure and the padding around the face does its job nicely. It's not quite as light but the Daydream's nose gap is too big on my face, which means I wear it too tight and feel it pressing against my forehead through its own padding. Other team members have had fewer issues but it's annoying to see light bleeding in. This will depend on which phone you're using, as each headset uses your phone's display. The best you can get, currently, with the Daydream View, is the 5.5-inch AMOLED Pixel XL, Moto Z, ZTE Axon 7, or the Huawei Mate 9 Pro, all of which have a resolution of 2560 x 1440 with a 534 ppi. Take note that if you use the regular sized Pixel, you'll see black bars either side of your VR picture. As for the Samsung, it depends what model you've got and what Sammy handset you slap in it. With a Galaxy S7, it'll be the same as above: a 5.5-inch display, 2560 x 1440, 534 ppi. The S6 and S6 Edge actually have a higher pixel density at 577 ppi with a smaller 5.1-inch screen. And the latest headset/handset combo with the Galaxy S8 gives you a 5.8-inch 2960 x 1440 display which is 570ppi. With both headsets, and their compatible phones, it won't compete with HTC and Oculus but it's not that far off the picture you'll get on the PlayStation VR. You can view bright, vivid, sharp looking CG games and 360-degree videos on both. Sure, if you look you can see the pixels and you'll be aware of the lenses, but neither headset has a screen door effect. With the right app or game, you'll be transported. Both headsets come with an Android companion app, which is how you set it up and download titles from the respective stores – we'd recommend downloading before you slip the headset on. When in VR, you can see very similar menus to drop in and out of apps. It's all very beginner and discovery friendly. The Daydream comes with a small, handheld controller that you'll need not just for individual apps but to navigate the menu too. Until the latest model, with Samsung, it was just buttons and a trackpad on the left hand side of the headset but all that changed earlier this year. The new Samsung controller tracks your hand motion and has a circular, clickable touchpad, which lets you point, drag and drop objects, tilt and, of course, shoot in Gear VR games and experiences. You can also hook up a Bluetooth controller (or Xbox controller) to play games the old-fashion button bashing way. The Daydream View controller is comfortable, light and easy to use without looking. There's a trackpad, app button and Home button plus volume buttons, and you'll get the hang of it quickly. Tracking of the position of the controller is okay, if not perfect every time, and the battery life is 12 hours which is pretty good. In use, both Samsung phones and the Pixel did heat up considerably but neither so much that we got worried about a face explosion. And in both cases, you'll get a couple of hours before you need to recharge your smartphone – this of course depends on what you're playing, how old your handset is etc etc. Right now, Samsung has the edge when it comes to sheer quantity of great apps and games to try out but hey, it's been building up its store for years and Daydream is still pretty new. Check out our ever-updating list of the best Samsung Gear VR apps, games and experiences. Samsung's VR video & experience platform can be accessed from a new Samsung VR app and there are 8,000 360/VR videos and 2,000 experiences, including 'Originals' like Doug Liman's VR series Invisible. Gear 360 users will be able to livestream to Samsung VR via the Samsung Gear 360 Manager app. To give credit to Google, it already boasts apps like YouTube VR (with Google Assistant voice search), Jaunt, Within, NextVR, Google Photos and Street View, Netflix VR (2D screen in 3D room still) all of which include loads of videos or places to explore. Because it has well, Google apps, it's particularly strong on video, virtual tourism and non-game apps. There are also titles we've seen elsewhere such as EVE Gunjack and Rose plus fresh experiences like Lego Brickheadz Builder VR and the gentle but wand-tastic Fantastic Beasts tie-in. Expect much more, from both big names and indies, as more headsets and compatible phones are announced. Price wise, both are affordable but not dirt cheap. The Daydream View price of £69 includes the controller and it comes in slate, crimson or snow. The 2017 Samsung Gear VR model, with controller, is £119 or you can pick up 2016's model for £89. Most of your decision about the Gear VR vs Daydream View will hang on which phone you have now, or which one you're looking to buy. But if there is a genuine choice right now, most people should go for the Samsung Gear VR – it has more apps and games and no light bleed no matter your face shape. If you care about the look of the thing or the handheld controller tempts you, Daydream View is a good long term choice, though, as it's only going to get better with time.